Why rewrite the same messages over and over again when you could click one button and reuse an existing email template? Perhaps you always send the same booking confirmation form all the time. Perhaps you send the same acknowledgement/refusal letter all the time? Save yourself some time forever and follow this tip. Start from a blank message or use an existing message. 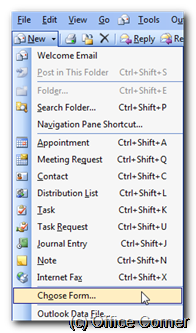 Save your message as a template by selecting Save As from the File menu. 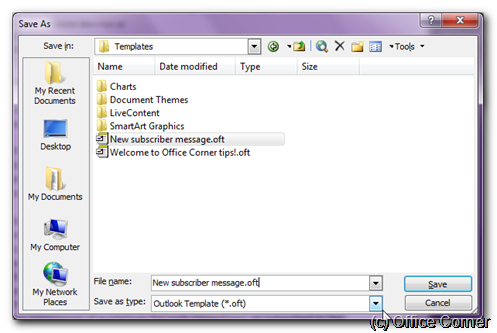 Give your template a name under File Name and Choose Outlook Template (*.oft) from Save As type. 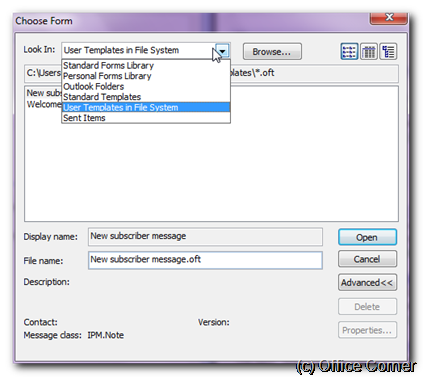 Make sure to browse User Templates in File System and select the template name you want to use. If you liked this tip, browse our other Microsoft Outlook tips, subscribe to the RSS feed or put a comment in the comment box. Yes, that box here, just here. why not share the tip with your friends and colleagues and make me instantly famous among all of you. I’d love that.